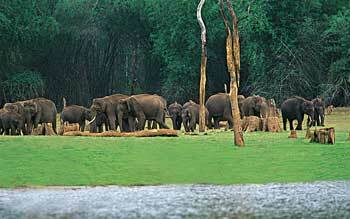 Periyar National Park is situated in the hills of Western Ghats in the state of Kerala in South West India. The centre piece of Periyar National Park is the 5500 hectare Periyar lake formed by the construction of a dam on the Periyar river in 1895. The dam submerged low - lying forest whose dead tree trunks still just out of the waters. Along the fringes of the lake are marshy areas with tall grasslands. This is one of the richest habitats of large mammals, as it provides both excellent cover and nourishment in the form of succulent shoots and grasses. Periyar, South India’s most popular wildlife sanctuary, encompasses 777 sq km, with a 26 - sq - km artificial lake created by the British in 1895. It’s home to bison, sambar, wild boar, languor, over 1000 elephants and at least 46 tigers. This is an established tourist spot, and can sometimes feel like Disneyland - in - the - Ghats, but the mountain scenery on the road up, the lake cruise and a jungle walk make for an enjoyable visit. Bring warm and waterproof clothing.